December 20, 2017 -- Mayor Sylvester Turner staff and The Way Home have exceeded their goal to house 500 chronically homeless individuals in six months. More than two dozen homeless service agencies and hundreds of staff members placed 548 chronically homeless individuals into Permanent Supportive Housing Programs between March – August 2017. Hurricane Harvey delayed confirmation and announcement of the achievement. 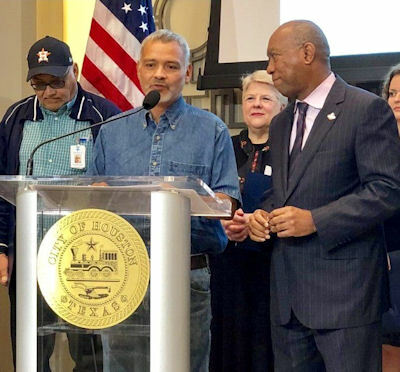 In March 2017, Mayor Turner announced a comprehensive and holistic approach to reducing homelessness, challenging the homeless response community to intensify efforts to permanently house the most vulnerable chronically homeless individuals on Houston’s streets. At the center of this plan was The Way Home, the collaborative model comprised of more than 100 private nonprofits and public organizations that has reduced overall homelessness by 60% since 2011. The unprecedented collaboration of The Way Home partners paved the way for exceeding the goal even in the face of major setbacks such as historic flooding and a federal freeze on housing vouchers. The City of Houston stepped in to cover the housing subsidy loss. Since 2011, The Way Home has housed more than 11,000 individuals in permanent housing and provided voluntary supportive services to help those individuals maintain their housing.